An early christmas presentappeared on my desk a few days ago…. a computer complete with internet connection! I haven’t blogged in a few months but I have been writing, reading and learning so having logged back on here I realise it’s time to start fresh and taking on board all of your comments hopefully I’ll not only make a better blog but also a better me. please find me at caswebb.wordpress.com , I look forward to touching base with all of you again! Editing, editing and more editing. Right now I have such a huge collection of nots that even my notes have notes and little reminders to change thing dot and check on this and that. But knowing every day the manuscript is getting closer to being readable by others is very exciting. I can’t wait to get my first lot of alpha readers a copy! Here’s my topic for the morning, info dumping. It really is a no brainer, info dumping is when you supply the reader with a lot of information in a very short period of time. This could be your mc thinking over whats happened in the story so far or in the case of science fiction or fantasy it could be a sudden overload on world building concepts. What I just realized I do, which is equally as bad, is disguise my info dump in conversations. This is still an info dump. So, how to remove the ‘dump’ portions but still convey the info? I’m not sure yet? I am about to re-read and try to add in more none info related dialogue between the info and see if I don’t end up with rambling. Chances are I will fail at least the first few attempts. Do you info dump? Did you realize you were doing it? How do you edit for it? Just a quick post on podcasts. There are probably heaps out there but there is one that I am currently hooked on: writing excuses. I wish they recorded and made available more of the panels etc from the writers festivals. Of course listening to your fav author talk about their latest work is exciting but more constructive is the conversations on topics like how these authors approach morals and violence in ya, or how they have actively or inactively branded themselves. If anyone comes across any good podcasts I’d love to hear about them. My latest crits from fellow writers focused a lot on my sentences. specifically my need to ‘tighten them up’ and the fact that in places they are ‘unfinished’. So i sat, once again, reading aloud to myself and trying to spot the problem areas. With the movie version playing in my head i found this just frustrating – of course it all made sense to me. Plan B, when hubby gets over his food poisoning from last nights chinese i’m going to ask him to read a few pages out loud to me. If he stumbles then the sentences obviously don’t flow logically for him. But in the mean time i’ve grabbed a few of my fav authors and opened their works to any random page, reading any random sentence and breaking it down into pace and point, verb, noun, adjective etc. To see where i’m standing in relation to those i admire. Being one of my fave easy searchers. Page 53 being a good starting point. But here i am back at the beginning. With too many options and not enough straight answers. I wish i could see my own floors as clearly as others can. It has to have a subject (noun or pronoun). This is usually the person, thing or concept that does the action in the sentence and is called the actor. It tells who or what the sentence is about. It has to have a predicate (verb or verb phrase). This is usually the action that the actor does. It describes what the subject is or is doing. And more, it gets very complicated even though we hope most of the time most of this just comes naturally. But when we seem to be forgetting the fundamentals tracking down the problem feels both mammoth and exhausting. I can point this out in the work of others more easily than in my own and as i say it so often i honestly thought i was doing it until last week. With the first chapter of my WIP on absolute write for some feedback i received a crit which highlighted four consecutive sentences and pointed out which one was showing, which was telling, which was over telling then back to showing… wow do i write like that? Yes it was all me and the reader was right – i just couldn’t see it. So i went back to page one and tried to rework the sentences that were telling and cut those that were over telling… with no luck. I couldn’t see which one’s were worded wrong or presented from the wrong point of view. So my task for me today is to hunt down some more information on the showing v telling battle and create or find some exercises that making spotting the difference easy in my own work. Telling: The trees are bent over from the heavy ice. There’s probably a lot of people going, ‘i knew that’, but i’m shocking with remembering these kinds of details. Figurative Language is the use of words that go beyond their ordinary meaning. It requires you to use your imagination to figure out the author’s meaning. For example, if someone tells you that it is raining cats and dogs, you know that there are not actually cats and dogs falling from the sky. You know it reallymeans that it is raining very hard. The PSSA evaluates students’ ability to figure out such language. There are several terms you should be familiar with to have a better understanding of each. Feel like a school student again? I do. Words that often occur when showing are: like and as. Words that could point out a telling sentence: i guess anytime you directly point out the thing/person in the spotlight. So too many he, she, me, my and I’s or your sentence could be popped straight into an instruction manual or recount. My first sentence is ‘I ache from top to toe.’ very straight forward, clear cut and instructive on my mc’s feelings. i now want to rip it to shreds. ways to restructure your sentences: (metonymy) use one word to mean a greater concept or group and (personification) use any noun as if it were a person or persons. ‘The world throbs in echo of the way my body feels.’ Better? Maybe i’m going to keep working on it. 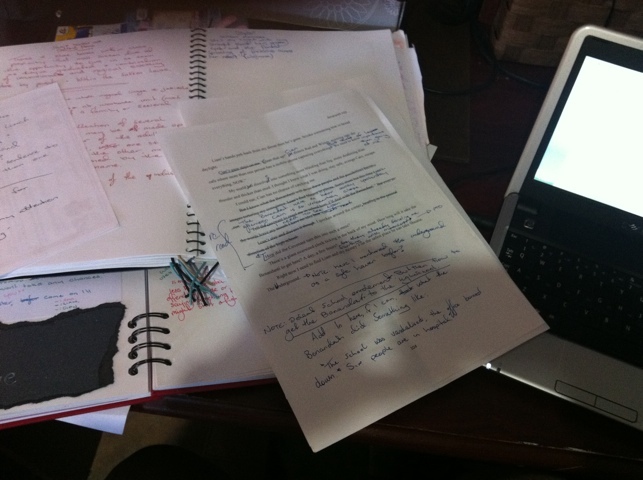 Working through the edits for one of my works i was given two rounds of feedback. The first noted that the first chapter of a fantasy should contain a little more of the fantasy world than i had offered up. So i set to work on the solution and ended up with a hundred or so words which i didn’t even know were important to the story until i had written them. They detailed the very reason the main character was important, the developing magical battle and a blurred line between good v evil which is one of the center points of the work. But i had not written a new chapter 1, 99% of what i write is in the first person and my MC is clueless which left me with a side character. One who knows everything but features very little in the actually work. A great new angle to play with. I termed this new chapter a prologue and asked for another round of comments. This time i was slammed back in the other direction. My feedback centered around the lack of need for a prologue and the fact that my helpful readers only read prologue plus chapter one didn’t help. But then if the book doesn’t make sense by chapter one there’s no use arguing that they should keep reading until it does because lets face it that’s not how you sell books. But even as i read my prologue i’m ticking off these boxes. Do i really need it?… maybe not but it’s doing a job that can’t be done any other way. What does it do?… it introduces the drama, the conflict and the imminent death of the mc from the get go. It adds the fantasy element that was missing from the first chapter. Does it do the job right? perhaps not, i can edit that in. but with all the editing i am still ending up with a prologue.